Explore the breathtaking beauty of the Riviera Maya on a tranquil 4-hour cruise from Playa del Carmen. Sail over the shimming seas with an expert captain, being transported to spectacular reefs for snorkeling adventures. Fish from onboard a stylish yacht, feast upon a delicious Mexican lunch and sip refreshing drinks from an open bar during your exciting excursion. Round-trip transportation from your Playa del Carmen hotel is included in the tour. Depart from your Playa del Carmen hotel in a comfortable, air-conditioned minivan and begin your journey to the Puerta Aventuras Marina. Board your stylish Piratas de Tejas boat, a 72-foot (22-meter) motorized yacht, and find a sumptuous spot on one of the five deck levels. Sip a refreshing drink from the open bar and absorb the idyllic ambience as you cruise over crystal clear waters. Arrive at Punta Venado, don your snorkeling gear and plunge into the inviting waters to discover the magnificent marine life of the protected eco-region. 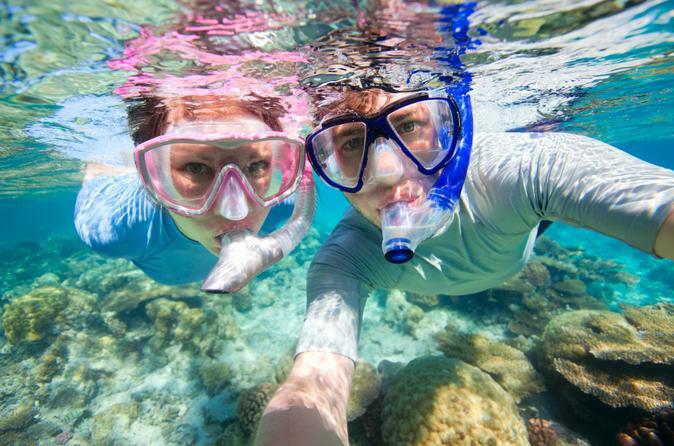 Marvel at sharp urchins, sea turtles and troves of tropical fish as you explore with expert snorkeling guides. Dry off in the warm midday sun before savoring the fresh and traditional flavors of your onboard lunch. Feast on fire grilled chicken, fresh guacamole, rice, beans, chips and tortillas while sipping cold and complementary beverages. Return to shore in order to partake in the relaxing sport of fishing; use professional fishing gear to snag a prize fish from the iridescent ocean. Relax during the return journey to your Playa del Carmen hotel, where the tour concludes.